A wide range of Craft products can be made from these beautiful & colorful felt sheets such as Hair Clips, Hair Bands, Keychains, Pencil Toppers, Fridge Magnets, Photo Frames, Custom Name Banners, Custom Name Boards, Wall, Door & Car Hangings, T-Shirt Designs, Pillow cover design, Bags & Purses, Dolls & Miniatures, Weddings & Birthday Gifts, Return Gifts & more. With our Felt Craft Starter Kit, you can learn 6 Beautiful Felt Crafts starting from Easy to Difficult. You should try to achieve as much perfection in these crafts, so try as many times until you achieve 100% perfection. After that, you can try other crafts with our bonus pattern sheets & also crafts from your own design. 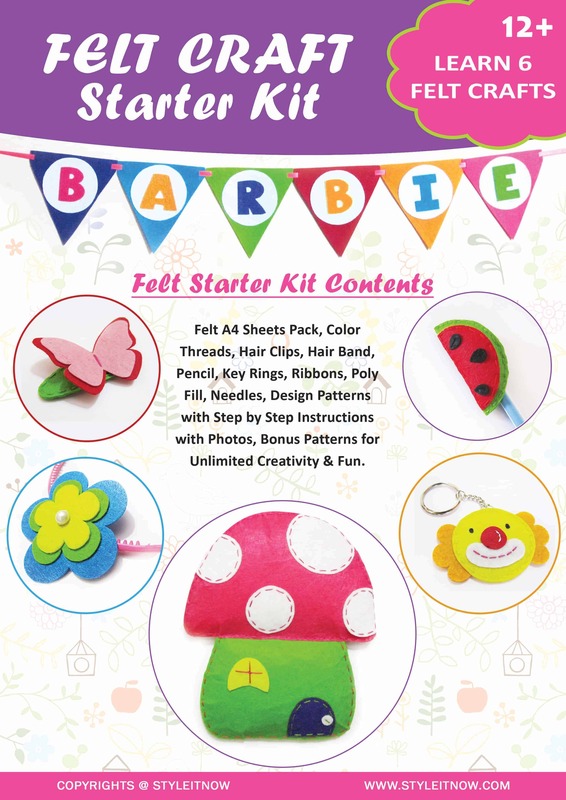 Our Felt Craft Starter Kit contains all the items required for you to learn & create these Felt Crafts. We have included pattern sheets for all the crafts & provided step by step instructions in a simple & easy way with photos. Felt A4 Sheets Pack of 10, Color Threads, Hair Clips, Hair Band, Pencil, Key Rings, Ribbons, Poly Fill, Needles, Design Patterns with Step by Step Instructions & Photos, Bonus Patterns for Unlimited Creativity & Fun. The gift to your loved ones! Give your loved ones the most creative Gift you could ever present. Gift wrapping along with a custom note is also available which gives a personal edge for your Gift. Our Felt Craft Starter Kit is suitable for Age 12+. Adult supervision will be helpful in the initial stage as hand stitching is required in various stages of crafting. Unleash & Discover the Creativity in You.